Michigan is now one step closer to a statewide smoking ban. Last week, in a surprise move, the Senate quickly passed the statewide ban that had been languishing in committee. Michigan Gov. Jennifer Granholm praised the bill’s passage, saying it “sends a strong message across Michigan and the nation that we place a high priority on the health of our citizens” and promised to sign any smoking ban that came across her desk. Never mind that the science doesn’t support the contention that smoking bans help non-smoking citizens. The Senate action was an unexpected setback for opponents of the ban, led by the Michigan Restaurant Association. The group’s spokesman, Andy Deloney, called a statewide smoking ban unwarranted government regulation that hurts Michigan’s business climate. Deloney said nearly 5,100 Michigan restaurants and taverns – about one of three – prohibit smoking, an increase of 130% in the last 10 years. He said owners made the switch to accommodate customers. 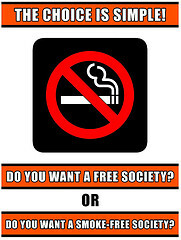 In other words, there is no shortage of completely smoke-free establishments, not to mention the fact that many places have non-smoking sections. The leading advocate for the smoking ban was state Senator Ray Basham, who has been trying to pass a statewide ban for a decade. Basham’s leadership on the ban is noteworthy because he has proven himself to be completely idiotic on the issue of smoking (and particularly cigars). Anti-smoking activists in Michigan couldn’t have a better spokesman: Basham is another example of an anti-tobacco activist so dedicated to controlling the lives of others with his smoking ban that he would ignore scientific evidence, common sense, and even basic decency. Did you see the front-page NYT story last month about the profound negative impact of smoking bans on charities that use bingo to raise money? Their income has dropped dramatically as players stay away and aren't replaced by non-smoking players. Washington State had 100 charity bingo parlors before the ban; now it's fewer than 20. You can read the story <a href="http://www.nytimes.com/2008/04/24/us/24bingo.html?sq=bingo&st=nyt&adxnnl=1&scp=2&adxnnlx=1210691598-FhurLibhIMYR+G1bY4yhvg&quot; rel="nofollow">here. the badgering arrogance of these ban groups is really getting to a lot of people, even non smokers. To complain about something being done to give our troops SOMETHING to enjoy is Anti-American. I see some of them returning, going to a bar that is complying with the ban, and saying "what am I fighting for"? The ban could be approved today. It even includes tobacco shops. Mike: It also includes tobacco shops? Now, if that's not the height of ridiculousness, I don't know what is. I mean, I disagree with smoking bans across the board, but at least I can understand the reasoning behind, say, wanting to ban smoking in restaurants. But in tobacco shops? Why on earth would a nonsmoker even walk into a tobacco shop? It doesn't even make a scrap of sense. Yes, it now includes "all places of employment," including tobacco shops. It's writtten so broadly, it could include hotel rooms. It had been amended by the state House last year to exempt cigar bars, tobacco shops that made 80% of their revenue in tobacco, and casinos, horse tracks and bingo halls. The Senate removed all exemptions and sent it back. There is speculation (a lot) that it will not pass the House in the all-inclusive Senate version since Detroit's 3 casinos are dead-set against it (there are 20 Native American casinos in Michigan it would not apply to). It was not voted on today. There is talk if the bill is sent to commitee, it will never emerge because Senate leadership was strong-armed into passing it the first time and does not want to deal with it again. In about short term auto insurance The so so deltona cheap car insurance quotes online .And cheapest cost for car insurance car insurance in oklah .